A couple of weeks ago after a somewhat difficult week, my husband and I decided to treat ourselves with a mid-week drive up to the Hudson river valley for a long walk with our dog and a visit to a local orchard to pick apples. Apple picking is one of my favorite Fall treats and we were just in time to catch the very end of the season and the last of the beautiful Fall foliage. I looked up an orchard I hadn't been to before and we decided to make it the last stop on our drive. About an hour out of the city the drive becomes beautiful. 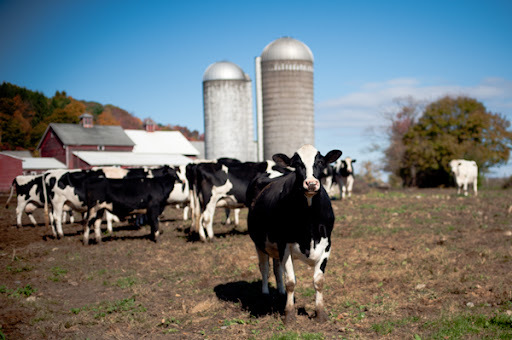 Toward the end, we pass scenic horse farms and grazing dairy cows. The area is woodsy and the trees are old and majestic. Fall is a wonderful time to visit: the leaves paint the woods a fire-y orange and at high points, the fallen leaves allow for peppered views to the Catskills in the distance. There's always somewhere fun to stop for lunch. We usually seek out a wholesome sandwich shop and a local coffee shop that takes its individuality (but not much else) seriously. This time, we stopped in Rhinebeck and remembered how much we like the town. We followed directions to the orchard and were surprised when we found an empty parking lot and happy to smell apple pie wafting out of a barn-like structure in the distance. As we approached we were greeted and told that we had come to the "offices" and that pick your own was several towns away - too far away to enable is to make it back to the city in time for our commitments. Needless to say I was very disappointed. It was my first and last chance at apples picked (myself) from a tree for the season. I sadly vowed to continue on with at least some of the lofty plans I had for my pick-your-own bounty. Buying apples at the farmer's market is not nearly as personally satisfying - but at least I know that someone else picked them for market from exactly the same area. Melt butter and brown sugar in a pan over low heat until sugar is dissolved. Stir in apple slices, cinnamon stick, vanilla bean pod and seeds. Partially cover and cook, stirring occasionally until apples are fork-tender. Discard vanilla pod and cinnamon stick. Divide apples among four oven-proof bowls. With your fingers, combine crumble ingredients, rubbing butter into other ingredients until it is evenly distributed and creates pea-sized crumbs. 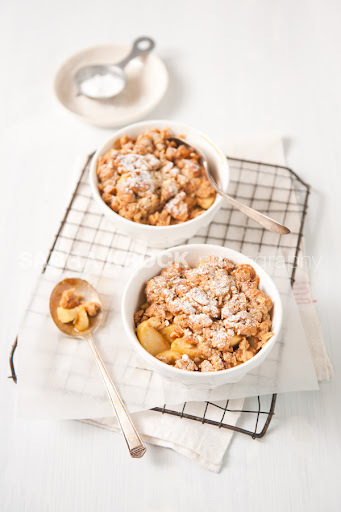 Distribute crumble over bowls. Drizzle with some of the cooking liquid and bake for 8-10 minutes until crumble is golden and apples are bubbling. Dust with confectioner's sugar if desired. I really like my apple crisp recipe, but yours has a couple of ingredients that sound enticing: vanilla bean, and almonds. Yum! I think you will have to have apple trees and cows up country. The crisp looks comforting and delicioso. 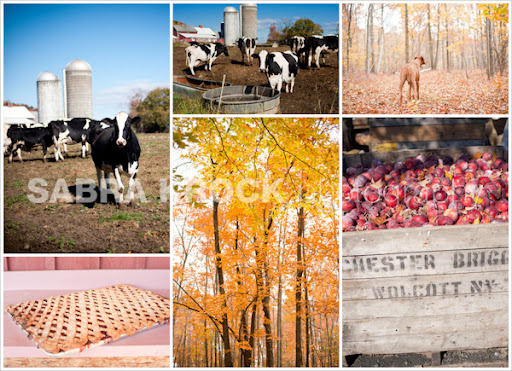 I love, love, love this Sabra...great shots, especially the wide angle one of the house! 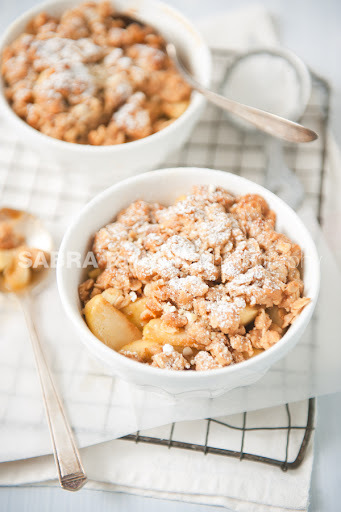 The apple crisp really screams fall! wonderful smell those crisps emit. Thanks! The cow looking at the camera looks so sweet. I've to try this recipe, looks yummy!!! I can understand that disappointment, but how wonderful that you do indeed appreciate something others take for granted. I love your pics. Great shot of the little pink nose and the cow. 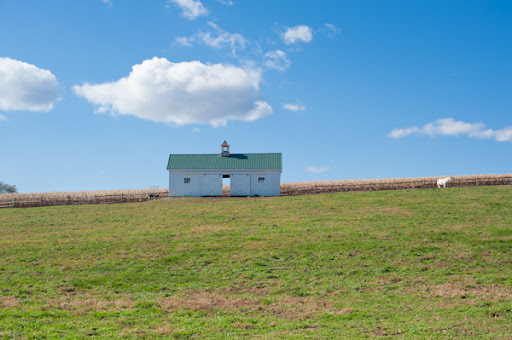 Liked the shot of the barn in the distance with the perfect clouds in a blue sky. The crisp is a delicious looking extra. Just the time to try it...along with the pumpkin pie. You've been very busy! Very pretty, Sabra. The recipe looks delicious. You have a gorgeous space here with some mindblowing photographs. Found you via Flickr.